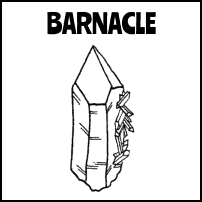 A Barnacle is a group of smaller crystals that are attached to a larger crystal. Usually, Barnacle crystals emit a very Old Soul, ancient feeling. The larger crystal is the “Old Soul” and contains the wisdom and trust that attracts the smaller crystals (the Barnacle, babies or new souls). Old Soul crystals with Barnacles are helpful to us in the way that a loving human grandmother/father or great grandmother/father would be (Imagine the Oracle from the Matrix movies). 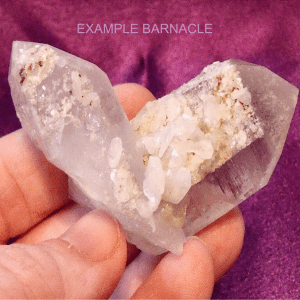 Barnacle quartz crystals help us to see things from a wider, deeper, wiser perspective. Double Terminated Arkansas quartz crystal point with a large Bridge crystal which has smaller Bridges and Inner Child points, and some Barnacles. Elestiated Arkansas quartz crystal point crusted with Barnacles on the backside. Double Terminated Arkansas quartz crystal point with lots of Barnacles and Drusy. Stepped Lineated Sides, Fairy Frost and Rainbows. Very pretty and blingy. Double-sided Arkansas quartz crystal cluster with mineral present from the mine, both large and small points, and lots of Barnacles. Large Empathic Arkansas quartz crystal point has sustained some damage, both old and new. Heavily Self Healed, dense with Fairy Frost, has some Drusy and Barnacles with wise, Feminine energy. Densely cloudy (Feminine) Arkansas quartz crystal point with Bridge/Inner Child points at the base and is heavily encrusted with Barnacles and has old soul energy. Empathic Arkansas quartz crystal point missing most of the termination with Self Healing, hundreds of layered Record Keepers, some Barnacles and Lineated Sides. Cloudy, mostly Feminine Arkansas quartz crystal point full of Fairy Frost, Mirror Fractures and Rainbows (Devic Temple). Has some Barnacles, a large crystal Imprint, and is in the beginning stages of Self Healing. An Arkansas quartz crystal point which looks chipped and dinged but the irregularities are actually small Imprints, Keys, Barnacles and Bridges.